So just how is Windows Phone 7 doing, and what is next in Microsoft’s effort to get back into the phone game? 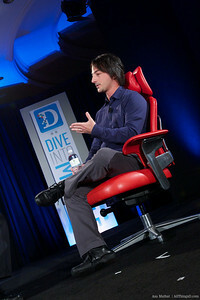 In the hot seat next at D: Dive Into Mobile is Joe Belfiore, one of the Microsoft VPs in charge of the company’s phone effort. We’ll see what he has to say on these and other topics, including a planned January update that would bring copy and paste, among other things. 11:48 am: Joe Belfiore gives a quick résumé. Windows Media Center, Zune, etc. 11:49 am: Walt: Why so late? Belfiore: We’ve certainly been doing phones for a long time. A lot changed in the industry with the iPhone. Belfiore says Windows Phone 7 tries to respond to what Apple has done with the iPhone and Google with Android. 11:50 am: Walt: What makes you think you are right up there when you don’t have a lot of things? Belfiore: (Points to Andy Rubin’s comments that Android is really for tech enthusiasts.) Belfiore says he agrees and that Windows Phone is built more for everyday people, to do the key tasks average users do and do so in an elegant way. “There are certainly some functionality shortfalls, and we are going to work to address them,” he says. Copy and paste coming in “early 2011,” he reiterates. As for multitasking, he says some tasks are there, such as background fetch of email and Web pages. Music playing works (but only if you are using Zune). Walt points out that is where iPhone was when it launched and it got away with it because it was so different from what was on the market. 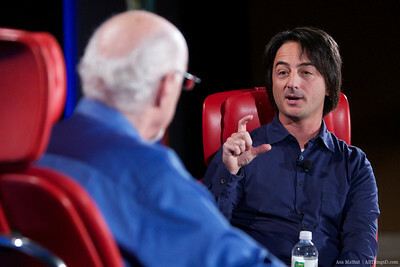 11:53 am: Belfiore says that some of Windows Phone 7’s features are worth the tradeoffs. As an example, he cites a feature that takes a picture with one click even if the phone is locked. “We’ve focused on valuable scenarios that are different,” he says. “Some set of users will choose the value of those scenarios.” Belfiore says that Microsoft still aspires to fill the gaps. Walt: How many have you sold? Belfiore: We’re not talking about numbers yet. 11:55 am: Talk shifts to Microsoft’s ad campaign that suggests Microsoft’s phone provides at-a-glance information so that people can go back to their “real” life. That, he says, is how the company was led to the dedicated camera button. Another good example, he says, is Live Tiles–icons that can update with notifications, photos or other data. 11:58 am: He’s talking more about the Live Tiles and the fact that you can have a tile for the people who are most important to you and then contact them in any way you want (text, photos, call, Facebook). 12:00 pm: Walt: How many apps do you have? Belfiore: I think the marketplace now has between three and four thousand. 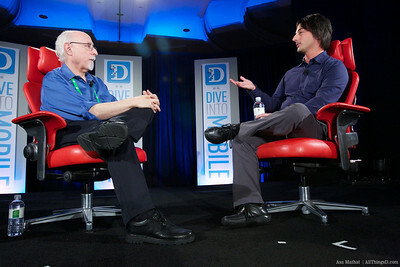 12:02 pm: Walt: (Google Android chief) Andy Rubin said that parts of Windows Phone 7 have been around a long time. Is it old or new? Belfiore: It’s mostly new. It is true we have kernel code that has been around for a long time. But that’s not a bad thing, he says. The code has been tested, the bugs have been fixed. It’s true on the desktop with Windows. It’s true of Linux as well. It’s probably true of Android, since it is Linux-based, which is based on Unix. 12:06 pm: Walt: Why not build your own phone? Belfiore: Our view is that both Microsoft’s core capabilities and our ability to affect more people would be greater with third parties building diverse hardware. 12:08 pm: Over time we expect to increase the variation that you see. “We are trying to get the benefits of constraint,” such as better user interface and making things easy for developers while still giving choice to consumers. 12:09 pm: Walt: How long will it take you to again become one of the big players in terms of market share. Belfiore: It will certainly take some time. He points out that current Windows Phone software runs on only about 10 phones, all high-end devices. Over time, they want to get to lower price points. Belfiore: I don’t know how long it will take. Belfiore: It will probably take longer than that. Walt: A couple of years? Walt: Who will be the leaders three years from now? 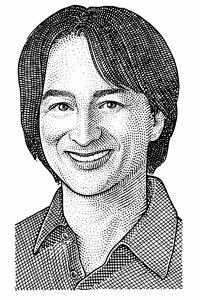 Belfiore: It’s certainly the case that there are a lot of people building good products. My personal feeling is things won’t change that dramatically that quickly. I do assume we’ll be in it. The question has to start with whether you have a great product….I think we have that so far. We’ll see how this plays off. BlackBerry has done that in the past. Nokia has done that in the past. We’ll have to see about the future. 12:13 pm: Walt: What about tablets, an idea Microsoft has championed for a long time. But what is the strategy? Seems to be desktop Windows is not a variation of the Windows Phone. Belfiore: Historically, Microsoft has tried to adapt Windows for other uses (e.g., Media Center, tablet). So far we’ve continued down that path. The work we have done on the phone has been focused on very small-screen devices. Walt: Why not just scale up? Both Apple and Android are working from their phone OSs in doing their tablets. Belfiore: We’re four weeks out of introducing this new thing. The state of the world today is Windows, is our broad operating system. Runs on same screen size as tablets. Q: How can phone makers really differentiate beyond apps and things like a keyboard and a camera? There’s no upper limit on what they can add in terms of hardware features. For example, a hardware maker could add near field xommunications or some other peripheral not already supported. 12:17 pm: Joshua Topolsky from Engadget asks about tablets again, says last answer a bit of a cop-out. “You can’t possibly be this blind” that Windows 7 isn’t going to work on tablets in the way you want it. Is that really the strategy? Belfiore hints that the announced strategy focuses on Windows for tablets, but says the company will evaluate that going forward. Belfiore; I wouldn’t count on that. Last question, from a mobile video calling app. As of today, no native access for developers that need things like native access to the camera. Belfiore: Individual software makers don’t, but phone makers and operators do, so software makers could work with them. He reiterates the platform is new and the goal is to open things up. 12:21 pm: Walt: One last question on carrier craplets. There’s a limited number of tiles on Windows Phone 7. On the two phones I saw, some of the space I saw was taken up by carriers. Belfiore: I really like our approach. I think it is really well considered. When AT&T sells a phone it is AT&T selling the phone. Makes sense for them or hardware makers to be able to showcase their differentiation. Both phone makers and carriers can create tiles, but the user can choose to remove the tile or even uninstall the app.